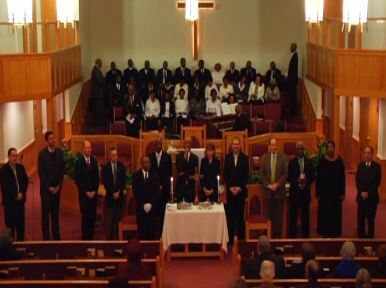 Last month, on Sunday, February 12th, I was privileged to speak at Elizabeth City’s annual Unity Service. 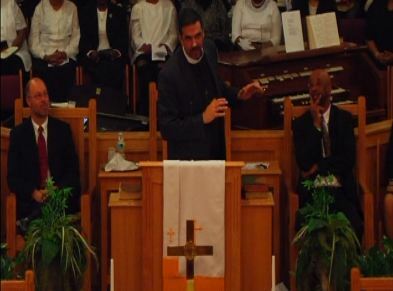 The service is coordinated each year by the Elizabeth City Ministerial Association, and I came at the invitation of their current president, Rev. Shawn Blackwelder, who currently serves as pastor at Riverside UMC. Below is the text of the sermon I delivered. Special thanks to the host pastor and church, Dr. Walter L. Smith, Jr. and the good folks of Cornerstone Missionary Baptist Church (and their outstanding choir!). We had a good time in the Lord. Good evening. First let me say how privileged I feel to be invited to be your guest speaker at this Unity Service. To Rev. Shawn Blackwelder and the clergy of the Elizabeth City Ministerial Association, to the host church, Cornerstone Missionary Baptist Church and your pastor, Rev. Walter L. Smith Jr., to all the churches, friends, and co-laborers with Christ in this corner of God’s vineyard, I bring you greetings in the name of our Lord and Savior Jesus Christ. I am deeply humbled by your invitation to me to preach here at this Unity Service, and ask for your help tonight – your prayers for and with me – as we together seek to hear a word from God. Would you please join me in a word of prayer? I want to reflect on a question with you for just a moment. It is one that I ran across in some of my recent reading, but it has stuck with me: What kind of day is today? How would you answer that question? It is the same question Jesus once asked when he said “When you see a cloud rising in the west, you immediately say, ‘It is going to rain’; and so it happens … You hypocrites, you know how to interpret the appearance of the earth and sky, but why do you not know how to interpret the present time?”  So in that same spirit, I invite you to ponder with me how to interpret our present time. So I ask you again – What kind of day is today? What kind of day it is technologically? Futurist William Knoke says that we live “in a fourth dimension – a ‘placeless’ society where ‘everything and everybody is at once everywhere.’” To put it differently, you could say we live in a day where Facebook has started taking precedence over real, “face-to-face” time with flesh and blood people; where information is no longer housed only in file cabinets or on library shelves, but in digitalized computer files and on large network servers, accessible not by car or card, but with nothing more than the click of a mouse or the tap of a touch screen; where revolutions and government repression are exposed as much by Tweeting, Youtubing, and virtual gatherings as they are by talking, petitioning, and grass-roots organizing. Did you know they are calling those born between 2000-2017 the “Digital” Generation (those now 12 and under), which is a group being weaned on a new generation of Video Games like Wii, the IPhone, the IPad, the Kindle, HD and 3D TVs, and Smart phones – all of which offers them an endless array of entertainment options that is theirs for the choosing and is shaping the way they think, interact with others, and their understanding of the world. What kind of day is it economically? In the words of Daniel Pink, we live in a day that has “more cars than licensed drivers” and where people in the U.S. “spend more on trash bags then ninety other countries spend on everything.” We live amidst a day where globalization has a new face and the peoples of the world can no longer operate without affecting and sometimes infecting – even destabilizing other parts of the world simultaneously. Where an “insufficient funds pink slip” in Greece, is the bounced check heard across the world and across the Atlantic in the NY Stock Exchange; where a ripple of fear around oil and gas prices can quickly swell to a tsunami-sized wave bringing with it war and any number of ill-advised, no-end-in-sight military interventions around the world, seeking to protect certain controlling-interests against other marginalized ones; where record high unemployment rates, bursting housing bubbles, and the rising cost of living keep people spending more time pointing accusatory fingers then pondering alternative solutions. And – we are raising a new generation who has never known a time without gas prices bouncing to $4 dollars a gallon, houses that are upside down, and who have experienced numerous, adult-led education initiatives that keep our kids endlessly studying towards a standardized test to see if they measure up instead of cultivating curiosity and a life-long love affair of learning that will endlessly equip them to adapt and thrive in an ever changing and diverse world. Even before the presidential inauguration, some began to herald the coming of a new, post-racial era free of prejudice and discrimination. Though such an era would no doubt be welcomed and celebrated by many, such claims not only showcase shocking political naiveté, they pave new roads for ethnic misunderstanding and historical amnesia. History just doesn’t work that way. More importantly church, neither does sin. Can anyone else see the elephant in the room? Can anyone truly believe that the volumes of real and virtual ink spilled over Barak Obama’s faith, his family history, his former pastor, his birthplace, his father, his mother, and his educational credentials have absolutely no relation at all to the color of his skin? Can anyone believe there is no connection – at all? The obvious answer to that question is “yes” – and thus, the elephant. It reminds me of the popular discourse during the Rodney King incident, the O.J. Simpson trial, or the more recent immigration debate we are still having in this post 9-11 world. Black, white, and brown perspectives are in many cases so dissonant that a visiting alien might think people were talking about different realities altogether. Upon closer observation, that is perhaps the very take away that we should glean – different realities. In order to live into the church’s high calling to be agents of reconciliation, we need to acknowledge and learn to appreciate different ethnic realities and experience, realities that often lead to radically different, comfort-challenging perspectives. But I’ll get to that more in a moment. What kind of day is it religiously? As one person has put it, “if there is one thing we can reliably predict about the 21st century, it is that an increasing share of the world’s people is going to identify with one of two religions, either Christianity or Islam, and the two have a disastrous record of conflict and mutual incomprehension.”  With regard to Christianity, let me say this – many of us Western, U.S. Christians are under the false impression that the church has been in decline over the past 40-60 years – that we are dying off in record numbers, that we have little hope for the future. United Methodists, like other mainline traditions, have been warned of a coming “death tsunami” that is about 5 years away from hitting as the baby boomer generation begins to approach their twilight years in greater numbers. So many have said that the church is in decline – but in reality, nothing could be further from the truth. What may be true of some mainline churches in the West and in Europe, is most certainly not true of the global church around the world. The number of Christians on the continent of Africa in 1900 was 10 million. In 2000 (over 12 years ago) it was 360 million. That is a growth of over 3.5 million Christians a year. That is a growth of over 9,500 new Christians each day. The most conservative estimates say that by 2025, there will be at least 633 million Christians in Africa alone. There are currently around 480 million Christians in Latin America; 313 million in Asia; 260 million in North America. Maybe some of us have missed it – but over the past century, the center of gravity in the Christian world has shifted inexorably southward, to Africa, Asia, and Latin America. If you want to visualize the “typical Christian” in the world today – statistically speaking – many former “majority” Christians have to rethink the stereotype. It is no longer a white, European or American male. Today, the typical Christian is a young black, African woman living in a village in Nigeria or middle-aged, brown-skinned woman living in a Brazilian favela. I could go on – but I think you get the point. When we see a cloud in the sky, we may think rain is coming and so it happens – but have we, in Jesus terms, failed to discern the present age? The present situation? The present cultural, technological, economic, and religious context in which we live? I ask you again, do we know what kind of day it is today? I raise that question tonight because I believe that is the kind of question Paul was trying to answer with his letter to the church in Ephesus. What kind of day was it for the first century church? Think about it with me a moment. This religious community – this community we call the “early church” had begun over two thousand years prior to Jesus’ birth; beginning with the emigration of one small clan from Mesopotamia – a wandering Aramean was our ancestor – we call him; Abraham along with his wife Sarah. And from this one clan came growth and diversification that eventually developed into multiple tribes in Palestine and Egypt. And these tribes eventually solidified into a kingdom – a kingdom that would rise – and fall – and rise again – and then collapse – and then experience what we might call post-exilic “reconstruction” – and then experience a new dispersion, a new diaspora, which is almost always the result after war and occupation by a foreign power. So that by the time Paul sits down to write a letter to the Ephesian church of the first century, he needs to first interpret the present time, he needs to first know what day it is, know what time it is, know “what’s up,” know “what’s going down,” know who’s who, know what’s what, know where this people have come from and know where this people are – before he could ever begin to imagine and pray and dream about where they were headed. In other words, he needs to “get it” before he can “get going” – he needs to “cogitate” before he can “prognosticate” – he needs to analyze before he can realize, formalize and strategize with other believers so that when he steps into the pulpit he can summarize and sermonize with words and deeds that points to the Jesus who wants to harmonize and change lives. And what kind of day was it in Ephesus? Some have called it the Ephesian moment. Many a sermon has rightfully pointed out that this passage points to the reconciliation of two races – Jew and Gentile – and how that can speak powerfully against modern day racism and prejudice, proclaiming reconciliation in the Jesus who has broken down the diving wall of hostility between peoples. But there is more than that here for the Jews and Gentiles of the first century stood for more than a diversity of ethnicity or race; they also stood for two different cultures in the church; they also represented two contrasting Christian lifestyles – Hebrew and Hellenistic – and guess where it all comes to a head, where it all goes under the microscope, where it all get magnified and intensified – at the meal table. One of the most distinctive and pervasive characteristic of Jerusalem believers was how they took every opportunity they could to eat together. But what happens when Jewish, Jerusalem, Kosher eating Christians begin to rub shoulders with Gentile, uncircumcised Christians start coming into the house with their Hellenistic eating habits and prepared foods and meat that may or may not have taken a trip through the pagan temple? Would it still be the mark of ALL the followers of Jesus that they would eat together? The real test would be at the meal table. The real test is who are you bringing home to dinner. The acid test of Christian unity and Christian fellowship across lines of race, ethnicity, culture, language, and lifestyle would be held to the ultimate litmus test of shared intimacy, vulnerability, and hospitality. At the end of the day – who will we eat with? Church, do you want to know what day it is? Do you want to know what time it is? It is time for the church to quit being the world’s tail-light and start being the Lord’s headlight. It is time for us quit embodying that famous 1963 quote of Martin Luther King Jr. that would be nothing but a cliché if it still, almost 50 years later, wasn’t still as true today as it was then – that Sunday morning remains the most segregated hour of the week – and start to live into the newly realized gift of the Spirit, who proclaims that in Christ, God has broken down the dividing wall of hostility between us. It is time for us to quit wringing our hands and shrugging our shoulders and saying “that is just the way things are in the South,” and start lifting our hands in praise and embracing our sisters and brothers in new-found efforts to proclaim good news to the poor, release to the captives, and recovery of sight to the blind. It is time for us to receive the gift of unity and reconciliation that has been given – gifted – freely offered – unconditionally shared – through the life, death, and resurrection of Jesus. If Jesus could forgive from the cross, we should be able to forgive from the comfort of our winter-heated and summer-air-conditioned homes. If Jesus could heal, cast out demons, extend hospitality to the last and the least and charge us to do “greater things than these” – then we can surely, by the power of the Holy Spirit, join hands and step together into our own Ephesian moment – step directly in our communities that are increasing diverse and divided with a message of hope, harmony, and love. If Jesus could come down from the mountain of prayer to enter the poverty stricken streets and communities of first century Palestine, then surely we can come out of our sanctuaries and enter into the lives of those who are lost, poor, abandoned, abused, hurting, drug addicted, depressed, isolated, consumeristic, and starving for love – announcing Jesus’ healing, restoration, love, and peace in word and deeds. Do you know what kind of day today is? The acid test is right here – at this table – where in our own Ephesian moment Jesus wants to meet us – right here – right now. This is the acid test. This is the meal from which true unity springs; this is heavenly food that feeds God’s earthly, gospel revolution; this is the place where we realize most clearly that Christ’s church must be diverse because humanity is diverse and Christ’s church must be one because Christ is one. One bread, one body, one in shared mission, one in shared purpose, one in an undivided witness to a broken and divided world. This is the meal of reconciliation that comes to us in something as ordinary as broken bread and shared cup. If we eat and drink it properly in this moment, it should challenge who we eat with – and who work with – and how we conduct ourselves technologically, economically, politically, and every other way – for every other moment of our lives. Amen. “The Externally Focused Quest,” by Eric Swanson and Rick Rusaw, p. 8. “A Whole New Mind: Why Right-Brainers will rule the Future,” by Daniel Pink, p. 33. “The Next Christendom: The coming of Global Christianity,” by Philip Jenkins, p. 214.